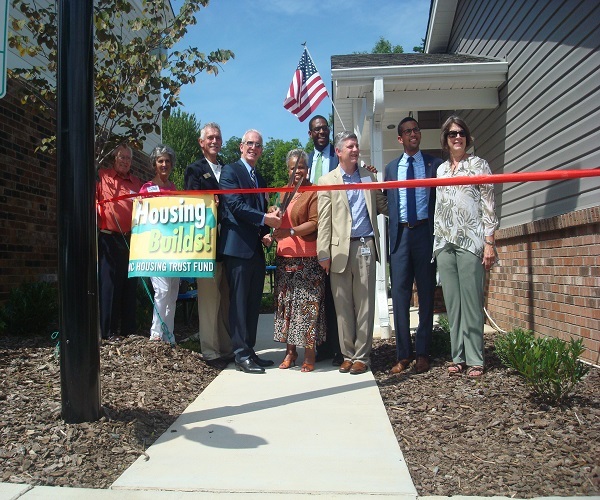 GREENSBORO, NC –Affordable Housing Management, Inc. will hold a ribbon cutting at Berryman Square apartments at 3:00 p.m. on Friday, July 15, 2016. The ceremony is the official re-opening of the complex after 17 months of intensive rehab work. N.C. Senator Gladys Robinson, Mayor Nancy Vaughan, Councilman Justin Outling and others are scheduled to participate. Berryman Square is 44 affordable one- and two-bedroom apartments. The rehab project included new, open floorplans, Energy Star appliances, heating/cooling systems, plumbing fixtures, cabinets and counter tops, flooring, light fixtures, and energy efficient insulation. Due to the extensive rehab, Berryman Square received National Association of Home Builders (NAHB) Green certificates of Emerald and Gold, the two highest ratings possible. New exterior amenities include playground, greenspaces with extensive landscaping, siding and shutters, community room with computer lab, on-site office, laundry room, covered mailboxes, and picnic areas with grills. The complex is non-smoking except in designated smoking areas. Rents are affordable at $447 to $500 for a one-bedroom apartment and $535 to $549 for two-bedroom townhouses. Affordable Housing Management, Inc. (AHM) is a 46-year-old private nonprofit that develops and manages affordable housing throughout Greensboro and surrounding areas. The public is invited to attend. Pictured from left to right: Park Davidson (AHM Board), Martha Miller (AHM Board), Paul Kennedy (NCHFA Board), David Levy (AHM Executive Director), Gladys A. Robinson (NC Senator), Justin N. Outling (Greensboro City Council), Jim Westmoreland (Greensboro City Manager), Rudy Olivo (U.S. House of Representatives) and Megan R. Cohan (AHM Board).